SPY rose by 0.5% this week, while my account fell 0.7%. The loss-floor is now -7.7%. Market news: The bears are licking their chops! Robert Prechter, of Elliot Wave Theory fame, has started sending out emails about his “drop like a rock scenario”. Cycle analysis has convinced some traders that the market will start dropping next week, hitting its usual bi-monthly low around August 7th (last year the decline was July 25th..August 9th). Of course, nothing ever goes as planned on the stock market, so I will wait for a “short” signal from my indicators. UPRO: Non-robot day trade. I tried to catch the end-of-day ramp on Thursday, but the ramp was too small and didn’t cover my trading costs. I did this trade by eye, but afterward it turned out that I would have gotten substantially the same results using MACD(10,30,20) on the 1-minute chart (which I had backtested some months ago). TNA: Rats! The stupid model said to buy this at (what turned out to be) Wednesday’s high of the day. Should reprogram the model to *wait* for a retrace before buying — although in this case that would merely have reduced the loss. This causes the robot to realize that it doesn’t currently own SRTY, so it will buy anew on Monday if the downtrend resumes. How to change the TNA/TZA models so they wait for a retrace after a breakout? Perhaps I need a new indicator RETRACE(size,significance) which will calculate a retrace of size percent of the distance from the most recent peak to a recent bottom. Significance would somehow have to define “recent bottom” — perhaps a number of hours of rising prices that must follow it? Before trying that, I decided to try replacing the PPO-based model with something simpler: how about a TRIX+MACD model? For my bearish tests on IWM, I ended up using TRIX(22,2) and MACD(10,60,13): short when TRIX < 0 and MACD > 0 and falling; cover when TRIX > 0 or MACD > 0 and rising. This works okay, but not as well as the PPO-based model. The problem seems to be that “waiting for the retrace” is not generally a good idea, at least for bearish swings. I suppose I should try a bullish test, to see whether this approach works better for those, but I haven’t done that. For last August’s crash, the TRIX+MACD model would have waited until August 2nd before shorting (because that is how long it took for MACD to go briefly above zero before crashing) while the PPO model would have shorted on July 26th. As a result, the TRIX+MACD model would have increased my account by only 11.5% on that crash, while PPO would have made 18.9%. For 2008..2011 as a whole, the TRIX+MACD model’s TZA profits would have been 31.5%, while the PPO model’s would have been 61.9%. I think I’ll stick with the PPO model. To get some use out of this abandoned research, I have added the TRIX rule to the TNA/TZA models. 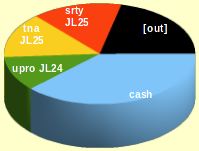 This helps only slightly: for TNA the four-year profit was 47.7% and win:loss ratio was 29:16, now it’s 50.7% and 29:15. For TZA the old results were 61.9% and 23:17, now 66.3% and 21:13. Much of these profit-increases come from retuning the models, since TRIX is blocking some bad trades so now they don’t need to be blocked by other indicators. PPO(8,71,12) fell by at least 0.006 during the two hours before that. PPO(10,57,10) rose by at least 0.025 during the two hours before that. Currently I have two bullish models (TNA=swing and URTY=trend) and two bearish models (TZA=swing and SRTY=news). What if I want to add a third model, such as a bullish news trade? There are only two pairs of ETFs that offer 3× leverage on the value of the Russell 2000 basket of stocks. However, there is also a pair of ETNs: RTLA and RTSA. The ETF/ETN distinction doesn’t seem to matter much: there are no tax differences since I am using a retirement account, and the tail risk if Barclay’s Bank were to go belly-up doesn’t seem much different since leveraged derivatives are “side bets with the banksters” which lose all their value if the world’s financial system collapses, whether bought via an ETF or an ETN. The trading volume of RTLA is abysmal—less than one trade per day—but does that really matter for a synthetic instrument whose shares get created on-the-fly when someone wants to buy them? On Monday, I watched the market. The good news is that Barclay’s (or whoever the market maker is) updates their bid/ask prices for RTLA every few seconds, even though days go by between trades. The bad news is that the spread tends to be around 7¢, versus maybe 2¢ for TNA. At 12:48, the offering price for RTLA was $64.65, while IWM could be had for $79.34. By 13:32, the bid for IWM had gone down by 0.3% while the bid for RTLA went down by 0.6%, which is only 2× even though it says “3×” on the tin. Multi-day charts show 3× performance for RTLA, but intraday performance (at least for early Monday afternoon) was only 2×. It looks like RTLA is not suitable for news trades, which often take only a few hours from purchase to sale.